Summer is the season for fresh, organic strawberries. Aside from being sweet and delicious, research shows that strawberries have numerous health benefits, and can even aid in weight loss. Strawberries are high in vitamin C, which has noted immune system-boosting properties. They are also a good source of fiber, and contain calcium, magnesium and potassium. Some of their most important contributions to our bodies, however, are several types of phenolic antioxidants. Phenolic antioxidants have been found by several studies to help reverse inflammation throughout the body, reduce your overall risk of chronic disease and help you lose weight naturally. The anti-inflammatory properties of strawberries aid the body in restoring balance to weight-regulating hormones. Some of the phenolic antioxidants found in strawberries are known as anthocyanins, which are responsible for their bright red color. Anthocyanins increase your body’s production of the hormone adiponectin, which functions as a metabolic stimulant and appetite suppressant. Anthocyanins have also been linked to a decreased risk of heart disease, as well as a lower risk of some cancers. They also help slow your rate of digestion of carbohydrates, which controls the spike in blood sugar that frequently occurs after a starchy meal. Ellagic acid, another antioxidant compound found in strawberries, also has these effects on blood sugar regulation. It is definitely worth it to choose organic strawberries over the commercially grown varieties. Besides avoiding exposure to pesticides, Washington State University researchers have found that organic strawberries have a higher content of antioxidants, phenolics and vitamin C.
The best place to find fresh, organic strawberries is at your local farmer’s market or roadside stand. These are usually just-picked, and will provide the best flavor. Just make sure to verify that they are organic. If these options are not available to you, your grocery store’s organic section will likely have fresh, organic strawberries, as they are grown in California all year long. It’s hard to find a snack more delicious and refreshing than a bowl of strawberries set out on the dining room table. They can also be sliced into salads, made into jams and compotes, and are a perfect smoothie addition. Try adding a little bit of cinnamon to your strawberry smoothie for a unique and tasty flavor. Previous articleStomach Growling: Annoyance, or Sign of Digestive Imbalance? 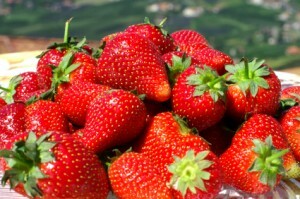 Hey Buddy!, I found this information for you: "6 Reasons to Eat More Fresh Strawberries". Here is the website link: https://www.thealternativedaily.com/6-reasons-to-eat-more-fresh-strawberries/. Thank you.